Once your updates are on autopilot, you'll never want to go back! Your card will not be charged during your 14-day 90-day trial. You can cancel anytime, and we will send you a reminder before your trial ends. What does StagingPilot do for me? StagingPilot keeps your WordPress site up to date automatically. You have enough to do without worrying about updating WordPress all the time. Let StagingPilot do all the updating and diligent testing. How does StagingPilot prevent my site from breaking? StagingPilot has an incredibly thorough updating and testing process. The StagingPilot robots analyze your site after each update to make sure everything looks the same. If anything breaks during an update, StagingPilot detects that before your site – and your visitors – are affected. Can I test new versions of PHP on my sites as well? 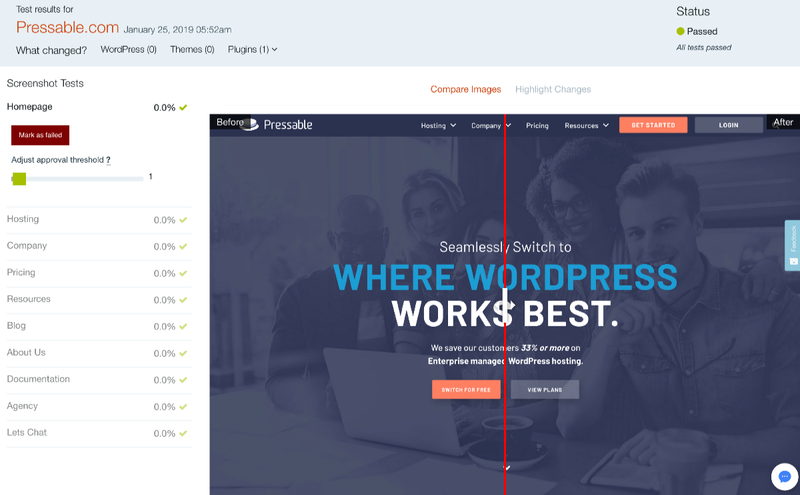 Yes, we can run the same visual analysis and testing – but instead of updating WordPress or any plugins, we leave everything the same on your site and only change the PHP version. You get visual confirmation that your site looks the same after upgrading to PHP 7.2, for example. Just get in touch after you set up your trial account and we can help you run that test on your sites! How do I get up and running? and as a Pressable customer, you're able to schedule a guided setup call where we will help you through the process!